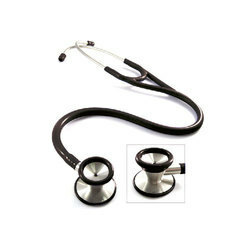 Providing you the best range of ss cardiology type stethoscope, ss stethoscope, fetal type dual head stethoscope, sprague rappaport type stethoscope and deluxe single head stethoscope with effective & timely delivery. 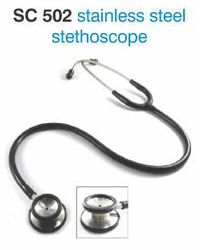 A Stainless Steel chest piece for maximum convenience and internal spring binaural for high acoustic sensitivity. 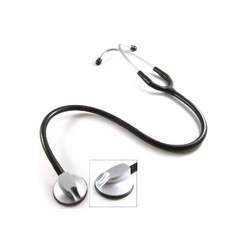 Premium quality stainless steel chest piece offers superior clear sound transmission. Binaural, Non-Chill Ring and Quality Diaphragm. The unique chest piece is designed with superior ability to listen to the fetal heart. Binaural/stem are made of brass with chrome-plating. 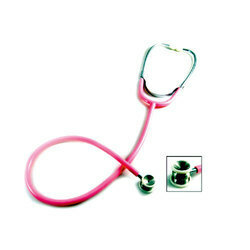 Designed for superior auscultation of the fetal. 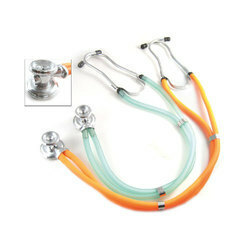 Matched colorful PVC tubing and diaphragm rings are available. Accessories: 2 Diaphragms. 2 pairs of ear tips. 3 ells. Coloured chest piece can be matched the colorful latex free tubing. Gel colorful PVC tubes are also available.